Synopsis: to make sure we never get too close, the primary narrative is presented as a play-within-a-play. Soviet peasants in dispute over land abandoned by retreating Nazi forces tell the story of young servant woman Grusha Vashnadze and how she saves the life of child prince Michael in a time of civil war. Abandoned by his well-bred parents, Grusha crosses mountains in her attempt to save him from his pursuers, adopting him as her own son and sacrificing any thought of her personal happiness. Ultimately rewarded for this sacrifice, she is the Everywoman whose courage and selflessness in the tumult of war is only matched by her innocence of its cause. 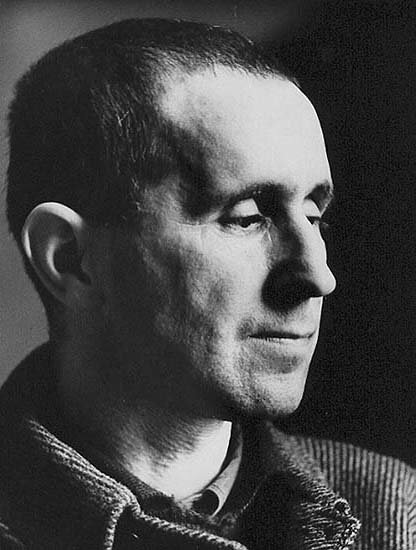 What moved me: the simple, painful lyricism of Brecht’s poetry. The exchange between Grusha and Simon (Grusha’s fiancee) when he has returned to find her married is excruciating. They cannot tell each other what they have been through and so it is left to The Singer to tell us what we already know. SIMON: Is the young lady saying that someone has come too late? Grusha looks up at him in despair, her face streaming with tears. Simon stares before him. He picks up a piece of wood and starts cutting it. So many words are said, so many words are left unsaid. The soldier has come. Whence he comes he doesn’t say. The battle began at dawn, grew bloody at noon. The first fell before me, the second behind me, the captain sabred the third. My one brother died by steel, my other brother died by smoke. My neck was burnt by fire, my hands froze in my gloves, my toes in my socks. For food I had aspen buds, for drink I made maple brew, for bed I had stones in water. SIMON: I see a cap in the grass. Is there a little one already? GRUSHA: There is, Simon. How could I hide it? But please don’t let it worry you. It’s not mine. SIMON: They say: Once the wind begins to blow, it blows through every crack. The woman need say no more. Grusha lowers her head and says no more. There was great yearning but there was no waiting. The oath is broken. Why was not disclosed. And hadn’t the heart to do away with it. Someone must be the helper. And the bleating remains unheard.